All the rich flavors and textures of rocky road ice cream in a brownie. Rocky Road brownies are a sweet, rich, indulgent treat perfect for your next party, or school event. 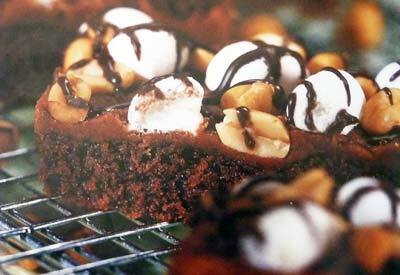 Kids of all ages will love the chocolatey, nutty, marshmallow creamy goodness of these chocolate brownies. Most people are surprised the first time they make chocolate brownies from scratch - because it's much easier than many people believe. We have three rocky road chocolate brownie recipes for you to choose from. The first one has all the goodies stirred right into the batter, the second uses them for a tasty topping and the third is extremely easy because it uses a brownie mix. Try all three, or choose the brownie recipe that sounds best to you. Lightly grease an 8-inch square baking pan and set aside. In a large bowl, combine the flour, butter, sugar, cocoa, baking powder, salt, eggs, vanilla and beat with an electric mixer on medium speed for two minutes. Stir in the nuts, chocolate chips and marshmallows. Spread the brownie batter evenly into the prepared pan. Bake for 20 to 30 minutes, until a wooden toothpick inserted into the center comes out with fudgy crumbs. Be careful not to overbake. Remove from the oven and let brownies cool on a wire rack. Cut your brownies into desired size and shape - we especially enjoy these as bite-size brownies. This recipe makes one 8-inch square pan of Rocky Road Brownies. Do you want to try a rocky road recipe for brownies that is slightly different? Here it is! Combine the butter, cocoa, and oil in a small saucepan. Heat over medium low heat until melted and smooth. Remove from the heat and set aside. In a large bowl, beat eggs with a whisk until light and fluffy. Mix in the cocoa mixture, sugar, flour and salt until just combined. Spread the chocolate brownie batter into the prepared baking pan. Bake for 20-25 minutes, until the brownies begin to pull away from the sides of the baking pan. Meanwhile, combine the topping ingredients and mix well. Immediately sprinkle topping evenly over the top of the brownies and continue baking for 12 to 18 minutes. Remove to a wire rack and cool brownies completely. Cut your brownies into desired size and shape. This recipe makes one 9x13-inch pan of Rocky Road Brownies with Toppings. 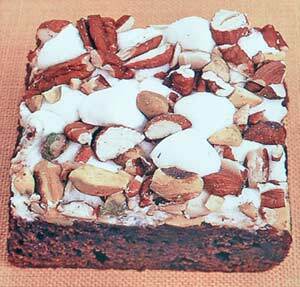 Toasted nuts and miniature marshmallows transform your supreme browni mix into something special. Lightly grease a 13x9-inch baking pan and set aside. Prepare brownie mix as label instructs. Spread the brownie batter into the prepared baking pan. Bake for 20 minutes or until toothpick inserted 2 inches from edge comes out clean. Remove pan from oven and evenly sprinkle top of brownies with marshmallows. Top brownies with chopped, toasted nuts. Return pan to oven and bake for 5 minutes, or until marshmallows melt slightly. Remove pan to wire rack and cool brownies completely. Cut into desired size and shape. This recipe makes one 9x13-inch pan of Easy Rocky Road Brownie Mix Brownies.